I read this article and found it very interesting, thought it might be something for you. The article is called Restaurant Review: Bewley’s and is located at https://www.totallydublin.ie/food-drink/restaurants/restaurant-review-bewleys/. 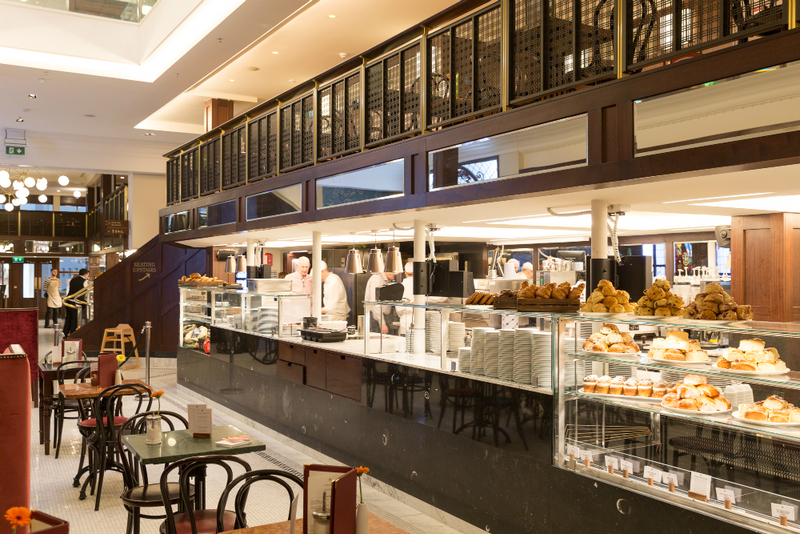 Change has been afoot at Bewley’s of Grafton Street. But just how much change is the right amount of change? 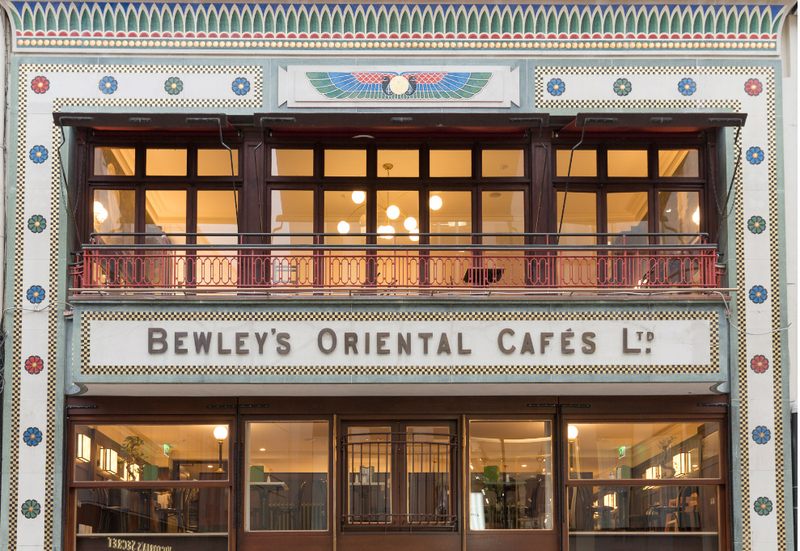 After being closed for nearly 1,000 days between 2015 and 2017, has Bewley’s recaptured the magic of their glory days? 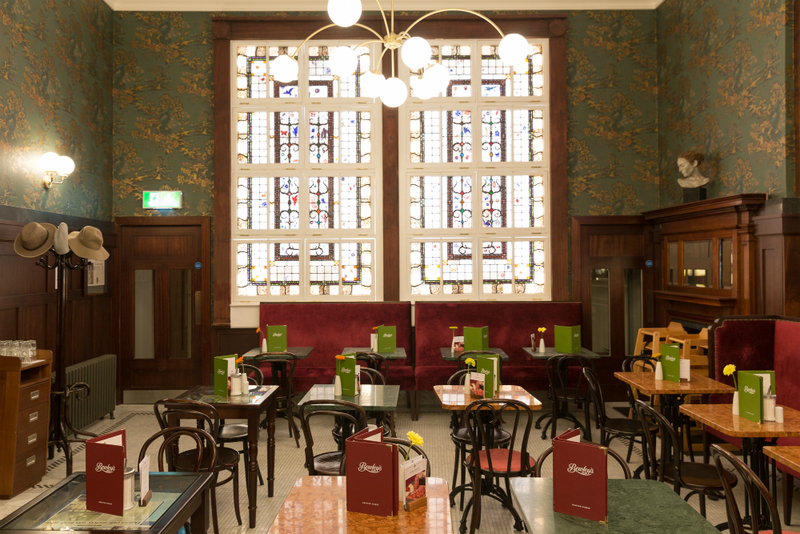 Can this café ever live up to the expectations of nostalgic Dubliners? 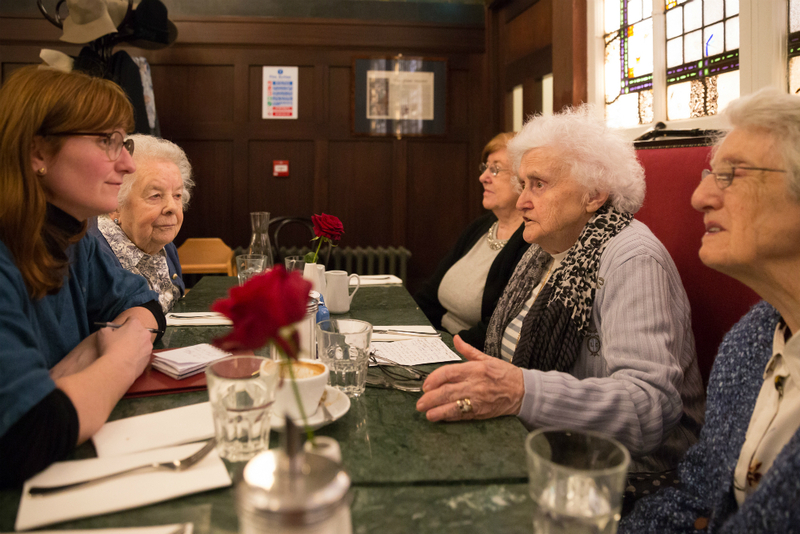 On a recent visit to the historic premises, I arrive armed with historical context provided by my lunch dates: my husband’s grandmother, Carmel Payne (91), and her friends Maureen Siggins (81), Una Henry (95) and Margaret May (79). This quartet first met when they lived in the vicinity of Bath Avenue in Dublin 4. They became friends over forty years ago, when they were members of The Pembroke Ladies Club who met every Monday night. 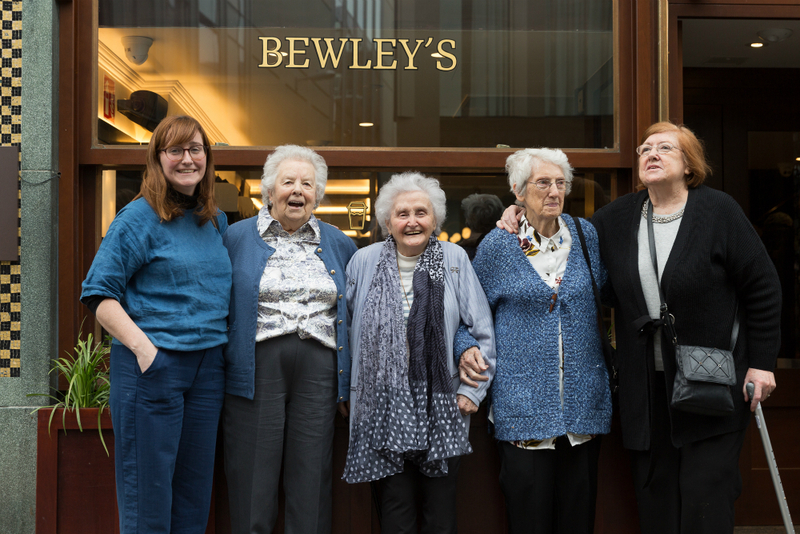 Bewley’s plays a part in all their memories of Dublin. 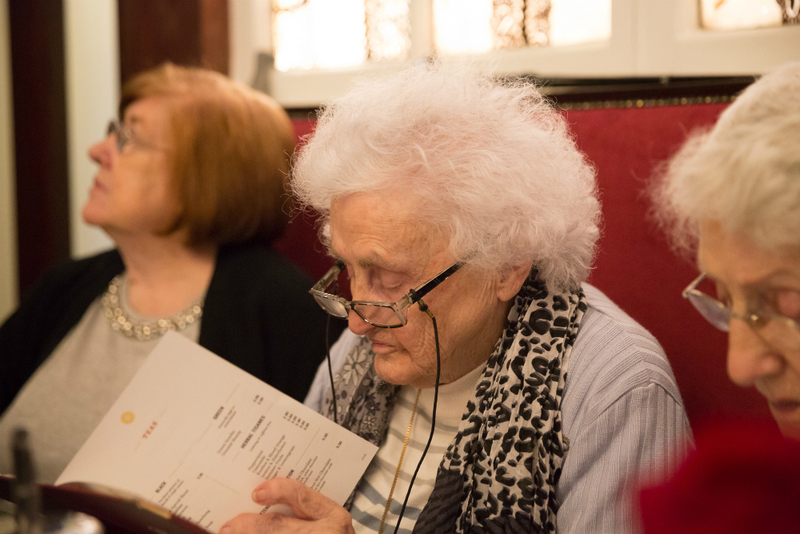 Maureen and her sister, Dorothy Reeves, used to come into Bewley’s for the odd breakfast before spending a day in the shops. Carmel worked as a shopgirl in Weir & Sons just down the road and would indulge in a rare treat of a sticky bun or shortbread from the café from time to time. “We didn’t have the money to go for coffees and cakes every day, like the young people today,” explains Carmel. “We also didn’t have the time – many of us were rearing children,” says Maureen. Una remembers coming into Bewley’s and reading the paper in a corner for hours, a luxury she thinks is rare these days. Why doesn’t that happen more often? They think it’s because cafés are under such pressure to pay high rents that they’re rushing customers in and out, and that the pace of life has gotten so busy that people feel like they don’t have any time to while away. It wasn’t just Dubliners who had a connection to Bewley’s. Maureen shares a story about her neighbour on Bath Avenue, Ann Keating, who was originally from Galway. Every time Ann went home to the West, she was under family obligation to bring Bewley’s Austrian bread to her mother. What made Bewley’s special, they all agree, was the coffee. They can recall the coffee roasting machine that once sat in pride of place by the front door. “Do you remember the coffee roaster used to wear a big chef’s hat?” asks Carmel. “And the smell of the coffee was gorgeous.” Maureen remembers that the milk came from Bewley’s Jersey herd in Stepaside. As a matter of fact, Ernest Bewley was the first person to import Jersey cows to Ireland, ever. Over a century before Maureen and Dorothy were having their pre-shopping Bewley’s breakfasts, Samuel Bewley and his son Charles imported 2,099 chests of tea from Canton in China to Dublin in 1835. They’re widely credited as being the first importers of tea to Ireland. In 1840, Samuel’s brother Joshua founded The China Tea Company which would eventually become The Bewley’s tea and coffee business we know today. The first café was opened on South Great George’s Street in 1894, and it was Joshua’s son Ernest (the Jersey herd gentleman) who opened Bewley’s of Grafton Street in 1927. Ernest’s son, Victor Bewley, became Managing Director of Bewley’s in 1932 and it was under his tenure that Bewley’s became as much a part of the identity of Dublin as Molly Malone, pints in Grogan’s, and walks over the Ha’penny Bridge. The Bewley family followed the Quaker doctrine of fairness, equality and community, and those values informed the evolution of the business. Bewley’s Cafés Managing Director, Col Campbell, tells me that The Mary Cake (€6.50), an elongated cube of almond and hazelnut sponge covered with a glossy coating of chocolate mousse, was originally introduced to Bewley’s by Hungarian refugees to Ireland employed by the family. The Campbell Bewley Group was formed in 1986 when Bewley’s was bought by Patrick and Veronica Campbell, Col’s parents, who have overseen the company’s evolution for the last two decades. Paddy Bewley has remained on The Board throughout that time, representing his family’s heritage and interests in the company. In February 2015, the company announced they would close for a period of six months for a full refurbishment. The Irish Times reported that Bewley’s was operating at a loss of €1.2 million annually. The closure, which saw 140 staff members being made redundant (according to reports in The Dublin Inquirer at the time) would reduce those losses while giving the company an opportunity to do a full refurbishment of their historic Grafton Street building. After an investment of €12 million, Bewley’s of Grafton Street reopened its ground floor for business in November 2017. The first floor, complete with a sliver of an outdoor balcony overlooking Grafton Street, increased the capacity of Bewley’s to just under 500 customers at any one time. The well-liked and missed Bewley’s Cafe Theatre on the top floor of the building is due to open at the end of March, at the time of writing. The menu, designed by Executive Chef Ludovic Lantier and his team, is available throughout the entire building, upstairs and downstairs. There’s a 24 hour bakery in the basement where all the pastries, buns and bread are baked daily by a team of 24 chefs and pâtissiers. There are 38 floor staff and 22 baristas, among them, are award-winning barista Seivijus Matiejunas, who is known to everyone in Bewley’s by his nickname – Elvis. What’s the verdict? “It’s very modern food,” they all agree. “It’s designed for young people. We’re used to our meat and two vegetables.” The menu is certainly a contemporary take on classics but the price of everything has moved with the times; in lieu of a straight-up ham and cheese sandwich is the Cured Irish Ham and Brie, which is a slice of bread topped with ham baked in the downstairs kitchen, served with brie and figs (€9.50), far from which we were all reared. For the comfort seekers, there is a croque monsieur (€8) and a shepherd’s pie (€14). The iconic Bewley’s breakfast (€13.50 for a classic fry) is back and served until 11am weekdays and until 3pm on the weekends. The cakes, coffees and teas are really where it’s at. One of the ladies has a peek inside the teapot to check for tea leaves. She’s satisfied to see that this pot is the real deal – tea leaves all the way – though she does remark that the teapots seem a little smaller than back in her day. We sit talking under the Harry Clarke windows for four hours, the staff checking in on us from time to time to fill up our cups and teapots, but leaving us be and letting us talk when we’re full up. The ladies once again recall doing that in Bewley’s in days gone by; burying oneself in a book or a conversation in a corner of the café for hours on end. When it’s time to go, the ladies walk arm-in-arm out onto Grafton Street, stopping at the take-away counter to buy a few sticky buns (both the classic cinnamon bun and the cherry bun are €3.50 and straight-forwardly delicious) before saying our goodbyes. I drive Carmel home and we talk about the day, but we also talk about life, the universe and everything. I realise with surprise that it’s the first time we’ve ever had a proper girl date, just us, in the decade that I’ve known her. “I feel like I’ve really gotten to know you even better,” she says to me, as I drop her off at home and we hug goodbye. I could burst with the feels. So, in its new incarnation, has Bewley’s managed to harness the power of the emotional connection that many have towards it? Well, sometimes you have to go a little off course to know where it is you actually want to go, and Bewley’s appears to have been on that journey. They got a little lost in the boom times, but they seem to have had a complete overhaul of their values and have homed in on what it is exactly that makes Bewley’s precious to Dubliners. Now I have my very own Bewley’s story. And it’s all about Carmel.